Showing results for tags 'elantris'. The Young Pyromancer [PENDING REVIEW] Theoretically, if Sel became a Shard...the biggest limiter on Shards is the Vessel's mind, would that be more limiting or less limiting? Brandon Sanderson [PENDING REVIEW] If the Dor were itself to become a Shard combining Devotion and Dominion, and were to pick up a Vessel? Because they're still Shards, they just don't have a Vessel. 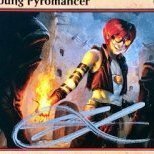 The Young Pyromancer [PENDING REVIEW] So the land couldn't be Vessel? Brandon Sanderson [PENDING REVIEW] The land itself? Of Arelon or of...? The Young Pyromancer [PENDING REVIEW] Of Sel. Brandon Sanderson [PENDING REVIEW] The land of Sel would not count as a Vessel. You would say in terminology right now that Dominion and Devotion do not have Vessels in the same way that other Shards do. Skyward Seattle signing (Nov. 10, 2018) Does this mean that the land of Sel isn't actually becoming sentient after all? Or, if it is, why? The foremost theory was that Sel itself was slowly becoming a Vessel, but we now have evidence that this is incorrect! Thoughts? Infographic map of Brandon Sanderson's Cosmere. 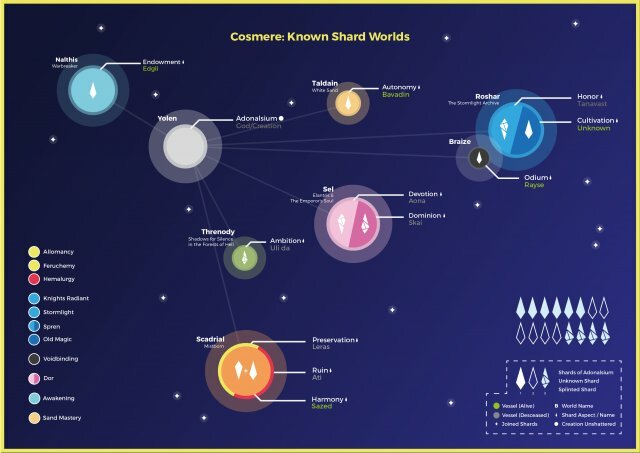 A infographic map created of Brandon Sanderson's Cosmere. Detailing magic systems, shards states and planets. From my understanding, every Cosmere magic system has a way to access the cognitive realm and worldhop. My question is then, do Elantrians do this with a variant of Aon Tia? Or is that bound by using distances as we see in the book - since you can't walk to the cognitive realm, could you travel there by Aon? Hello, I'm a new prospecting reader to the Cosmere uniververse. I decided to get into the series in order of release from Elantris to White Sand Volume 2 and beyond. My delima is that I thought that I had bought Elantris 10th Anniversary Edition when I purchased the mass market paper pack from my Barnes & Nobel here in America because Sanderson said, in a post back in '15, that all prints would convert to the new edition exclusively. Well... it was not the 10th AE. And I live 2 hours from the nearest bookstore and am a poor college grad— and it was also purchased two weeks ago —so returning it and getting the new version is out of my control right now. So, my question to you is, even though this is the original version of Elantris, could I still read it and enjoy the rest of the universe (like, does it properly fit into the canon)? If not, should I hold off on reading anything until I eventually buy the new version? Thanks. Would the seons be a type of spren? Ok, another silly question, again, I have not read through the whole of Elantris, but am quickly gobbling it up. When Raoden becomes an Elantrian does he and other Elantrians ever have to or need to use the bathroom? Like they feel hunger and pain acutely, but what about needing the toilet? If a normal human on Scadrial were to drink from the Well of Ascension, would they become an Allomancer? Would a human on Sel drinking from the Pool become an Reod Elantrian, as they don't have the Dominion part of the Dor in their body? What would happen if someone drank world-specific Investiture? Possible Effects of Elantrian Magic? Ok, so from a WOB a while back, it was said that Allomancy was powered by the pattern of the molecular structure of the metals, similar to the patterns that Elantrians must draw to access the Dor. This begs the question... would an Elantrian on Scadrial b able to draw the molecular pattern of... let’s say iron... and have access to the metallic arts? The whole “location based” aspect of the Magic really confuses me so there may be something I’m not understanding. This is a question I’ve had for a long time. Since we already have Aon Daa for use as an offensive weapon, what would Aon Sheo (death) do? We never see it used, would it function sort of like the killing curse in Harry Potter? Does anyone know what Aon modifiers look like? Such as the ones Raoden used to set the distance when he used Aondor to cross the ocean? Also, how do you connect Aons to get different effects. And is there a bigger list of Aons than the one in the 10th anniversary edition of Elantris? I am working on a connected Aon art project. Aurum the Inkspren posted a topic in Introduce Yourself! I'd like to choose this topic to be my introduction to the 17th shard. Out of all the cosmere novels, what particular book and particular quote did hit you truly? Like, you just stop and put the book on your chest because it feels too close to what you are experiencing at the moment? This scene always was one of my favorite from Elantris. I've drawn it before (though my skills were not up to the challenge it provided at that time). It's always been a profound image that lingers in my mind. How is altitude factored into Aon Tia? In Elantris, we learn that to make Aon Tia work effectively (read: avoid teleporting into walls) you need to input the exact distance you want to go. When Raoden travels to Teod, Adien tells him the number of steps away it is and they get there without any difficulty. But Sel is round, and its surface isn't flat. Different parts of the land are at different altitudes. How is the target destination's height above or below sea-level (or whatever the in-world equivalent is) factored into the creation of a successful Aon Tia? Going, for example, south in a straight line for any significant distance will cause you to reappear in midair because of the curvature of the planet. Was it just luck that Raoden didn't teleport into the air or underground? Thanks in advance for your answers! Finale: Shao Elantris glimmered as sunset fell over the land. Alone, above Kae and the other surrounding cities, it defied the night for only the second night in many years. Of course, last night, everyone had been too afraid to watch it. Too afraid of knives in the night, of the wrath of Shu-Dereth, of death. Tonight, on the other hand... Tonight, beggar-children climbed every rooftop they could find to sit together and watch Elantris grow brighter as the sky dimmed. Tonight, the nobles climbed to the towers of their high mansions or rolled out in extravagant carriages to get a better vantage point. Tonight, mothers brought their children out in the streets to see the miracle, and tell them stories of the olden days. Inside the gates of Elantris, the Four Restorers stood in silence. There was work to be done, far more than Kae dreamed - the walls may have been restored, but the scrolls were gone or half-rotted; those Elantrians who hadn’t already discovered the Well and left were few and far between and still coming to their senses. The walls glowed, but their knowledge had been reduced to nearly nothing. They had not even quite cured Aladdin yet, when a decade ago it would’ve taken a few minutes. That didn’t matter to Kae, though, even if they’d known. Elantris’ return ultimately didn’t mean new miracles and perfect health to them - they’d gotten used to living life without that, in the long years since its fall. But they watched the silver gleam of the walls of Elantris as night fell, and for the first night in many they felt true hope. Kainae stood up, stepping down from the wall she had been facing for more time than she cared to admit. She began walking home somberly. Tears still flowed down her cheeks, and she thought of her “meeting” with herself on the wall a day earlier. She was likely mad, hallucinating, seeing visions of her future self that simply didn’t exist. Perhaps she had deserved to step off the wall when she had the opportunity, giving her compromised mind peace in the afterlife, where she could have gone to join Enelan, at his side, where she truly belonged… No, she said to herself emphatically. You know better than that. She may not clearly understand it yet, but Domi had spared her for a purpose, and she would find that purpose and carry it out. Using the same mental techniques she practiced in ChayShan, Kainae stuffed the morose thoughts of her lover self into the back of her mind, concentrating on her motions, which sped up as she paced towards her house. One, two, one, two… she counted in her head as she rounded a corner. The rhythmic thump of her footsteps and the consistent counting cleared Kainae’s mind, dispelling some of the exhaustion she had felt from kneeling on the wall for nearly a full day. At last, Kainae took the final left turn and ended in front of her house. She frowned. Her easel was still knocked down from the second confrontation with the Cultists over the course of the last several days. She propped it up, gazing at the crumpled paper with a critical eye. Tearing off the first few sheets, which were damaged beyond repair, Kainae looked at the remainder of her easel. It was still hopelessly bent, the paper unable to be reflattened and the easel itself broken in some places. This would not do. With a sigh, Kainae went to her desk, popping open the center drawer and taking out one of her precious canvases, rigid and undamaged. Unsure of what she was really doing, Kainae selected colors. The black of mourning and death and evil. A silvery gray, to represent the moonlight under which the Cultists killed. A deep green for nature, which remained in harmony despite human conflict. And finally, white, the color of hope and light. Then, moved by a sudden impulse, she seized the four colors, taking mostly black and grey, and dumped them into the same cup. Letting the mixture settle and mix for just a few seconds, she poured the contents of the cup onto the center of her canvas. 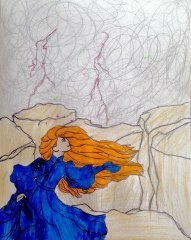 The different colors bled outwards, creating patterns and shapes Kainae had no control over. Letting Domi direct the flow of the paint, she stepped back, watching as the colors mixed and spread. Amazingly, not one drop of paint ran off the edge, an occurrence only explainable by Domi. Or Jaddeth. Thoughts of Enelan quickly sprang to mind again, but she smothered them instantly, refocusing on her painting. It was definitely abstract, Kainae decided. However, two things stood out to her. The coloration was the first: the structure of the gray on the bottom of the painting, the gray-green areas, the black at the top with the strange formation that looked like a bird of some sort. These were the lands owned by the farmer Eoni, viewed at nighttime from the mountains to the east. More specifically, it was his fields, with the strange rock called Eagle’s Jaw jutting out in the middle of them. But why would Domi show her this? Kainae then looked at the center of the painting, where the white paint had formed an Aon. Shao. Change. Transformation. A change may be happening in Eoni’s lands today, she mused, but for an Aon to be in the middle of my painting, there must be some other meaning. Perhaps Domi wished to tell her about a major change in the world? Elantris had been restored, a large change that would produce yet more changes in the future, and maybe Domi warned her of this turbulent time. Or perhaps it was more personal. Kainae herself was changing. She certainly was not the person she was two days ago, when Enelan had been by her side. She was not the fearless Jindo that had chased away the Cultists coming for her. Her love of honor in battle had dwindled since then, after she had fled and run into the other Jindo on the night after. And she was not the artist who sat in her room, alone, painting for hours on end, for Kainae would not be that restful again. She was none of those people, and yet, she saw all of them reflected in her. Lover. Warrior. Artist. Broken. She could transform, had been transforming into something better. Domi would continue her renewal past Enelan’s death. And so would she. But first, something was going to happen in those fields of Eoni tonight. Kainae left her paints behind, and rushed to find out what it was. Eoni sat in the fields as the sun began dipping below the horizon. He had finally found the Aon plate, and had decided to destroy it. He walked through the city, carrying the plate, to Elantris’ pool, and dropped the plate in. The Aon itself disappeared, but the plate remained engraved and intact. Well, that would do. Eoni returned to his fields, where a crowd armed with torches and pitchforks had gathered to face him. They had decided to come to his extraordinarily grassy field, and stopped at its edge. Nigel, who appeared to be acting as the leader of the crowd, spoke. “You’ve been behind the killings! You knew that the Elantrians would see your acts, and you hid from them! Stop this horrid act, and die. We’ve got a message to send to "the Ja”—we don’t accept these sacrifices in this city!” With that, the mob moved to surround Eoni, pitchforks held at the ready. “You really shouldn’t have come here.” Eoni said, and flashed a wicked grin. 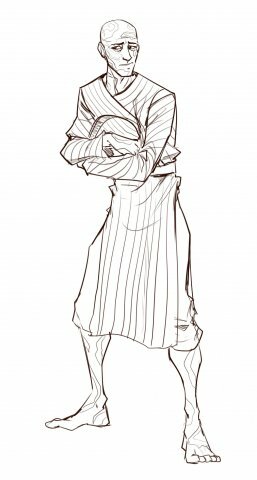 “These fields are mine!” Eoni dropped to one knee and placed his hand in the soil, then began chanting in a strange language... *** In strolled across the wall of Elantris in the faint light of dusk, the meeting with the others concluded. He passed a guard, who stopped and saluted him crisply. The Elantrian Guard no longer policed the Elantrians, they served them. In made his way to the western portion of the wall, and looked out over the fields that stretched between Elantris and Kae. Down there, somewhere, was the secret tunnel leading out of Elantris that they had discovered last week. They still hadn’t had time to do anything about it, but they needed to do something. Board it up, or at least post some guards there. As In looked down, he noticed something strange about one of the fields. It had been plowed in crazy, twisting patterns. It kind of looked like Aon Shao, but different. Twisted. Different somehow. Suddenly, the fields lit up with an ominous, red light, forming a pattern. It was Aon Shao, but interspersed with strange modifiers- not like the modifiers used in Aon-Dor. They were reminiscent of the patterns the Jeskeri cultists had been using. Shao meant “change,” but this aon had been altered. Corrupted. “That can’t be good,” In said, then began running towards the guard he had passed, calling the alarm. *** Down in the fields, the crops began writhing and growing at a furious rate. Their lush green color faded away, replaced with a soft red glow. Within seconds Eoni was completely obscured by the corrupted crops, and villagers began crying out in panic as the plants thrashed about, leaving burning welts where they touched skin. Suddenly Eoni appeared, dashing through their ranks and swinging a twisted dagger. Villagers cried out in panic and dove out of the way, but Eoni didn’t stop to finish them off. “He went this way!” “After him!” *** The plants pulled away from Eoni as he ran, making a beeline for the rock formation known as the Eagle’s Jaw. Within a couple minutes the formation was in sight, and there, at its base, was the pile of shrubs that concealed the smuggler’s tunnel. Eoni just had to reach that tunnel and he would be in the clear. If the mob tried to follow him he could just collapse the tunnel behind him and bury them all alive. But before he could reach it, Sheodan burst out of the wall of glowing plants and cut Eoni off. Sheodan was covered with red welts from the plants, but his training as a soldier in Eondel’s army had allowed him to ignore the pain and catch up to the escaping Cultist. Sheodan swung his sword at Eoni’s head, but Eoni ducked under the blade and lashed out with his dagger, slashing the soldier across his gut. Sheodan grunted and fell back, clutching at the wound. Eoni growled, and moved to finish the soldier off. “SHEODAN! NO!! !” The voice came from behind Eoni and he whirled just in time to catch a glimpse of the Elantrian ANGUS before he barreled into Eoni knocking him aside. *** ANGUS dropped to his knees by Sheodan, tears forming in his eyes. He began drawing Aon Ien in the air- he hadn’t yet mastered the healing Aon, but he had to at least try to save his dear friend. Eoni grabbed his fallen dagger and scrambled back to his feet. He glanced at ANGUS drawing in the air over Sheodan, tempted to rid himself of two foes at once, but he could hear the sounds of the rest of the mob getting closer- they would be here any second. No time. He turned back to the rock just in time to see another Elantrian, Rhomil, emerging from the secret tunnel, looking surprised and scared of the scene before him. This lone, terrified Elantrian was now all that stood between Eoni and escape. Eoni gripped his bloody dagger and charged forward. *** Rhomil’s took in the horrifying scene in front of him. Corrupted, overgrown plants glowing with an evil red light writhed wildly. Sheodan lay on the ground in a spreading pool of blood while ANGUS tried desperately to get the healing Aon to work. And Eoni, who must be the Jeskeri cultist, rushing towards him with a bloody knife in his hand. Rhomil’s mind raced. He had no weapon- other than Aon-Dor, but he didn’t know any dangerous Aons. He didn’t know how to create fire or stop a man dead in his tracks. All he knew how to draw was Aon Nae, magnifcation- useless- and… He began hastily drawing in the air, his fingers leaving glowing trails in their wake drawing an aon and including the most powerful modifiers he knew. Eoni was getting closer. A dozen paces. Eight. Five. Two. Rhomil finished the aon, then closed his eyes and drew the chasm line. *** Aon Ashe burst alight with a brilliant white light- brighter than the sun. Eoni screamed, blinded by the shining Aon. He swung his dagger but missed and tripped over a rock. He fell and the dagger was knocked from his hand. He searched frantically with his fingers, trying to blink away the afterimage of the Aon burned into his vision. The villagers caught up to him first. As mob seized him and began stabbing him with pitchforks, Eoni gave the best inflamed-throat shout he could. “PRAISE THE JA!" I hope nobody minds the long write-up, we had multiple people contributing to it and since it was the finale we wanted to make it special. @Elbereth wrote the section about night falling on Elantris. @Fifth Scholar wrote the part about Kainae painting, and also made the Shao painting. @Walin wrote a death scene, part of which made its way into the write-up (In his version he gave up way too easily, and I couldn't let that happen, so I changed it and expanded on it. I hope that's alright, Walin. ) If you liked the writeup, make sure to give each of them upvotes! Walin has been lynched! He was the last remaining Cultist! The Jeskeri Cultists have been defeated! Arelon has won! @Devotary of Spontaneity and @Jondesu/ @Kynedath were lovers, and have won by surviving until the end of the game! Vote Tally: Eoni (Walin) (4): ANGUS (Jondesu ), Nigel (TheMightyLopen), Rhomil (Cadmium Compounder), Sheodan (Devotary of Spontaneity) Bill (King Cole) (3): Amati (Kidpen), Eoni (Walin) Straw (Straw) (1): Kainae (Little Wilson) Final Player List: Links Master Spreadsheet Spec Doc Jeskeri Doc Shu-Dereth Doc Elantris PM log GM thoughts to follow in a later post. Because all of the Shards of Adonalsium have their own predesignated Intents, I have come to wonder if Adonalsium itself had an Intent of its own before it was shattered. And I believe that Intent, and therefore the name we can ascribe to the power of Adonalsium, is Unity. First of all, this stems from the nature of the religions on Sel, as shown in Elantris. The two dominant religions on Opelon in conflict with one another are Shu-Korath and Shu-Dereth. The way I see it, Shu-Korath relates closely to the Intent of the Shard of Devotion, and Shu-Dereth relates closely to the Intent of Shard of Dominion. Both were killed and Splintered early on Sel, but they still have a great influence on Sel, not just in the form of seons and skaze, but in the form of religious precepts. And what is it the Korathi and the Derethi are both striving for in the world? Unity. They seek to unite all people, but in different ways. The Korathi preach love, the Derethi preach control. Unity through Devotion. Unity through Dominion. Of course, this could be seen as the effect of people’s interpretations of Intent rather than Shards themselves, so who knows. My second point is a rather weaker one, relating to Scadrial and its Shards. When Ruin and Preservation are combined into one, they for the dual Shard of Harmony. It is a perfect Unity of the two most opposing Intents. If anything, I consider unity and harmony to be synonymous one with another (and so does the thesaurus ). Third of all is in the Stormlight Archive, Honor repeats the same command to Dalinar in each of his visions – Unite them. It almost even seemed a bit out of character to me that the dead Shard seemed to care more about unity on Roshar rather than the honor of mankind. We don’t even know entirely what he means by that phrase, but it is his ever-present plea. Unite them. Whatever it means, Honor desires unity of some sort. And in Oathbringer, it reaches a culmination that seemed to be set up from the start of the series. The previous points could be considered speculation, but this is a real example in the books that works as evidence. The linchpin for this theory is the climactic scene in Oathbringer in which Dalinar swears his third Ideal, opens Honor’s perpendicularity, and is referred to as having Ascended. When Venli asks him who he is, he responds, “I am Unity” before uniting the three Realms. This seems to go along with what Honor’s visions have been saying to him. The interesting part is this: it’s right after he says those words and brings the Realms together that Odium steps back in fear and rage, saying, “No, we killed you! WE KILLED YOU!” Now, why would he say that in direct response to Dalinar calling himself Unity? At around that same time, Dalinar remarks to himself that Odium suddenly seems small compared to him. It seems to me that in that moment, Dalinar somehow took up a bit of Adonalsium when he briefly Ascended and somehow knew it, which was why he referred to himself with the title of “Unity”. There are even moments in the series before and after that scene where he describes feeling a warmth and a light that comes from somewhere beyond, something different from Honor. It makes me think that the voice telling him to “unite them” may not even be Honor’s. And if it is, it seems to bear the touch of Adonalsium. On Roshar, Dalinar is meant to “unite them” to save humankind. On Sel, the religions based off the two Shardic Intents are looking for unity through devotion and dominion. On Scadrial, Sazed has become the unified form of two Shards as Harmony. As shown by these three series, unity seems to be a big driving force in the cosmere, one closely related to some of the Shards and perhaps something beyond even them. Why? Because I think Unity was the Intent of Adonalsium, and that it has left its touch on the Shards even after all the time it was Shattered. 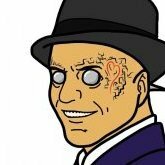 So my next big question is – if the ultimate power of the cosmere was the godly embodiment of unification, then why would people want to divide it? But hey, that's just a theory. A Cosmere Theory! Thoughts on this theory as a whole? TL;DR: Adonalsium had the Intent of Unity, with possible evidence given in Elantris, Mistborn and the Stormlight Archive. blackflame451 posted a topic in Introduce Yourself! I started with Elantris and just finished the first Mistborn Trilogy.